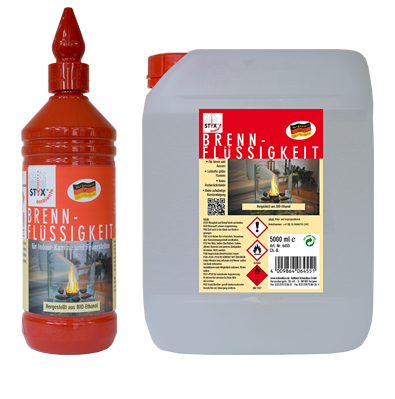 STYX burner fluid for decorative fireplaces and hearths is produced from high-quality bio-ethanol. In addition to controlled, consistent quality, we also guarantee a lively yellow flame and residue-free burning. Safety is guaranteed by the STYX child-proof bottle-cap and the STYX filling spout with non-reverse reed valve. This allows simple, targeted topping up of your hearth. STYX burner fluid is available in a 1,000 ml bottle and a 5,000 ml cannister.